Should Cabinets Go to the Ceiling? There are a lot of decisions to make when planning for new cabinetry in your kitchen. From color and construction style to the layout and organizational features you want to incorporate, the options can make your head spin. 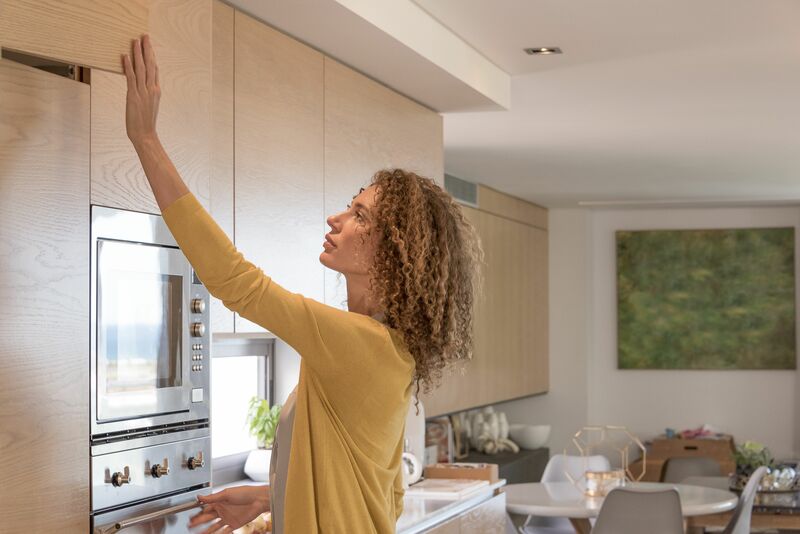 But before your head spins right off let's talk about a cabinet question that may seem daunting but is actually pretty easy to tackle – should your cabinetry go to the ceiling? This is a topic that comes up at one point or another during the design process and the truth is the answer is solely based on three main points: Ceiling height, ceiling details, and aesthetic preference. Let's talk about how any one of these topics can really dictate whether or not your cabinets should go to the ceiling. The height of the ceiling in your kitchen is probably the most straightforward indicator of how tall your kitchen cabinets should be. Eight feet is probably the shortest ceiling height you will encounter and used to be somewhat of the standard. Because of this most stock cabinets were designed to accommodate this height in one of two ways. Cabinetry including trim (crown molding) goes all the way to the ceiling with one wall cabinet. The cabinetry including trim does not go to the ceiling. Typically the wall cabinets and trim will be just below the ceiling. Any house crown molding will continue around the room, above the cabinetry. Cabinetry including trim goes all the way to the ceiling but in this instance, the cabinetry will likely need to be stacked. Meaning you will have something like a 36-inch wall cabinet with a 12 to 18 inches of high smaller cabinet on top of it. The cabinetry does not go to the ceiling and there is a large open area between the top of the cabinetry and the ceiling. It is not uncommon to see people decorate this open area with knick-knacks or plants. If your ceilings are any higher than ten feet, don't take the cabinetry to the ceiling. Functionally speaking cabinetry higher than this would be extremely difficult to get to and would essentially be purely decorative. Aesthetically, if cabinets get too tall they can really overwhelm the space. Beams and other architectural details can add another layer of confusion to the topic of cabinet heights. Should cabinetry intersect with the details such as beams or not? Cabinetry in a kitchen with ceiling beams should not go to the ceiling. In most cases, ceiling beams are just decorative and do not actually offer any structural support. However, if you want your space to feel authentic you have to consider that if the beams were in the home before the cabinets (because they are supporting the upstairs or the roof) then the cabinets and beams would not be integrated and the cabinets would be installed below. Plus, by installing the cabinets below the beams you are allowing both details to have their moment individually as opposed to muddying them together. If you have tall ceilings and want to draw attention to the height whilst maximizing the drama, cabinets to the ceiling naturally bring to the table, consider integrating a library ladder! Not only is this accessory super cool but it is only viable for those with super tall ceilings, plus it will allow you a way to easily access items stored in the upper cabinets. When it comes to cabinet heights there is no right or wrong, making the right decision just requires a good dose of consideration for the space that you have, the storage that you need and the overall look you are going for.